Suggested Usage: As a dietary supplement, take 1 tablet daily, preferably with meals. Consider taking this product in combination with NOW® Bioflavonoid Caps, Grape Seed Extract, Pycnogenol® and Alpha Lipoic Acid. Calcium Ascorbate is a buffered salt (mineral) form of the water-soluble antioxidant Vitamin C (ascorbic acid). Calcium is reacted with ascorbic acid to buffer the acidic nature of this vitamin, making it more gentle for the special needs of those who may have a sensitive gastrointestinal tract. The pH of this buffered mineral Ascorbate is approximately 6.8~7.4 as compared to ascorbic acid that is about a pH of 2.5. Calcium Ascorbate provides approximately 10% elemental calcium. What does Calcium Ascorbate do? Ascorbate (vitamin C) is a reducing sugar (has a reactive ene-diol structure) that is involved in biochemical processes such as hydroxylation of proline and lysine utilized in the formation of collagen and healthy connective tissue. A deficiency in Ascorbate results in a disease called scurvy which manifests as weakened collagen fibers, rotting teeth, delayed healing and open sores on the skin. Ascorbate is involved in many other vital functions such as the mobilization of iron, stimulation of immune system and as an anti-oxidant for scavenging of reactive free radicals. Is this a necessary vitamin or can our bodies make enough to satisfy our needs? Many plants and animals do not need to consume foods high in ascorbic acid to meet their need for Vitamin C because they are genetically programmed to produce enzymes that convert glucose into ascorbic acid. Unfortunately humans have only 3 of the 4 enzymes necessary for internal production of ascorbic acid, therefore we must satisfy our physical needs for this important vitamin through our intake of foods rich in vitamin C and/or take a good supplement. What is the function of the Citrus Bioflavonoids? Bioflavonoids are biologically active Flavonoid compounds found throughout the entire plant kingdom. Since the discovery of Flavonoids in 1936 when they were first isolated from lemons and called citrin and Vitamin P over 4,000 different types have been characterized. Though there are several forms of Bioflavonoids in the complex the predominant form is Hesperidin. These Flavonoids exhibit beneficial effects on capillary permeability and therefore support blood flow. They are antioxidants that work synergistically with Vitamin C.
Why are there color variations in your different Vitamin C products, and are they safe to take? Most natural Vitamin C products vary in color from batch to batch and bottle to bottle. There are normally variations in the color of the raw material used during manufacturing, which is a normal occurrence. This is due to natural color variations in the source of the Vitamin C generally, you will find C supplements to range in color from a light tan color to a light gray color. 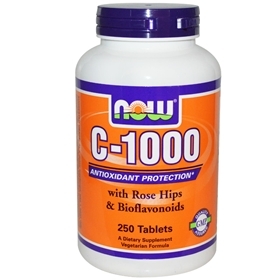 Over the course of the shelf-life of a Vitamin C supplement, oxidation can cause a slight change in color, so you may find the light tan C-1000 you bought has changed to a darker tan six months later. This is a normal occurrence, and the product is safe to use up until the expiration date, and even beyond. NOW® is generally conservative with expiration dates, so a Vitamin C product is still safe after the date, it just may not be as effective due to oxidation. Many people do not want to or cannot swallow capsules, tablets or softgels, for various reasons. Encapsulated Vitamin C products from NOW® can be opened and dumped into a liquid for consumption. Juice or water is recommended if you choose this method. However, taking Vitamin C with water on an empty stomach is the recommended method of ingestion. We do not recommend trying this method with Vitamin C in tablet form, although you can grind or smash a tablet into powder form and add to water or juice. If you choose to do this, use a mortar and pestle for best results and minimal loss of product. Why go through the trouble when NOW® carries Vitamin C in a powdered form already. Save yourself time and trouble by ordering this form instead.